Xfinity East Plaza at the AmericanAirline Arena in Miami. The AmericanAirlines Arena in Miami, Florida, opened its Xfinity East Plaza this week with help from NanoLumens and NRG. 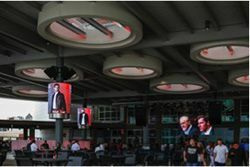 The HEAT Group, owners of the AmericanAirlines Arena and the Miami HEAT NBA basketball team hired NanoLumens to create a visual environment using six of its NanoSlim and NanoWrap solutions at the Xfinity East Plaza. The 23,000 square foot outdoor plaza is made up of a stage, a bar, food from local eateries, live music and entertainment, seating and high-speed internet. The opening of the Xfinity East Plaza will turn what was previously a smoking area into a major new entertainment area. The venue features a 720 square foot, bi-level performance stage with LED lighting, special effects lighting truss and a 70,000-watt audio system. Five NanoLumens screens are also suspended 10 feet off the ground and NanoSlim solutions provide imagery throughout the venue. NanoLumens installed five 8’X6’ 4MM pixel pitch non-faceted NanoWrap solutions in the Xfinity East Plaza along with one 16’X9’ NanoSlim solution to show the game live outdoors. The six NanoLumens solutions were made available to the HEAT Group through NanoLumens Advantage program. They were designed to help businesses gain a competitive sales advantage with the technology, protect against obsolescence, and secure budget approvals.